Your website is like your personal piece of art, in the sense that it’s never really finished. You constantly find yourself tweaking this and that, for a multitude of reasons. Maybe you want to offer your users some new functionality or you want to make some search engine optimizations. Unfortunately, one such tweak can have a dramatic negative impact on your website: changing your website’s permalink structure. You may find that after switching from one permalink structure to another all your social share counts are gone. Nowhere to be found. for marketing reasons you’ve moved your website from one domain to another. In all of these cases, you may lose all your share counts. Social media platforms don’t see WordPress posts, they see links. If one of your posts had 3 different links since publishing, each one of those links will have its own social share count. Social media plugins pull the social share counts only for your post’s current permalink. Before you start dying on the inside. Your social proof can still be saved. If you find yourself in this unfortunate situation, Social Pug Pro now has the capability to pull social share counts for old variants of your posts’ links, sum them up and display them to your users. 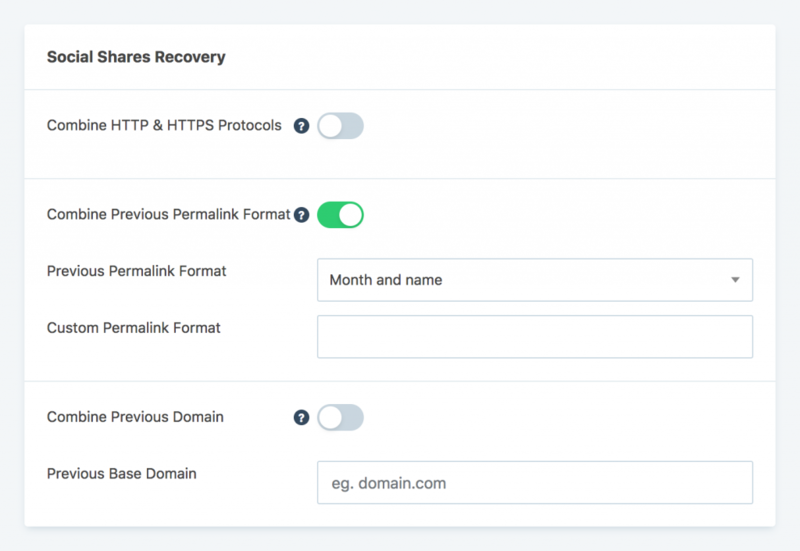 The beautiful part of this system is that everything is done with just a few clicks in the new Social Shares Recovery panel found in the plugin’s settings page. Let’s dive into a few permalink changing scenarios to see how you can set up Social Pug to pull the proper share counts for your posts. If you’ve recently installed an SSL certificate on your website, you might have noticed that your website’s permalink doesn’t start with “http” anymore, but rather with “https”. Some social media platforms, mainly Facebook and Pinterest, consider these two variants different links and store social share counts for both of them. To pull social shares for “http” and “https” versions of your post’s URL, the only thing that you need to do is to activate the “Combine HTTP & HTTPS Protocols” option as shown in the screenshot below. Changing your permalink structure is quite a big decision and it can impact heavily your SEO performance. For the good or for the worse. Recent studies have shown that shorter URLs rank better in Google and many website owners have made the switch from a longer permalink format to a shorter one. Sometimes, unfortunately, at a loss for their social proof. If you are in this situation, to get those share counts back up with Social Pug, activate the “Combine Previous Permalink Format” option and select the format that you previously had. For easy selection, the select dropdown contains the same formats you can find in your WordPress admin area -> Settings -> Permalinks. 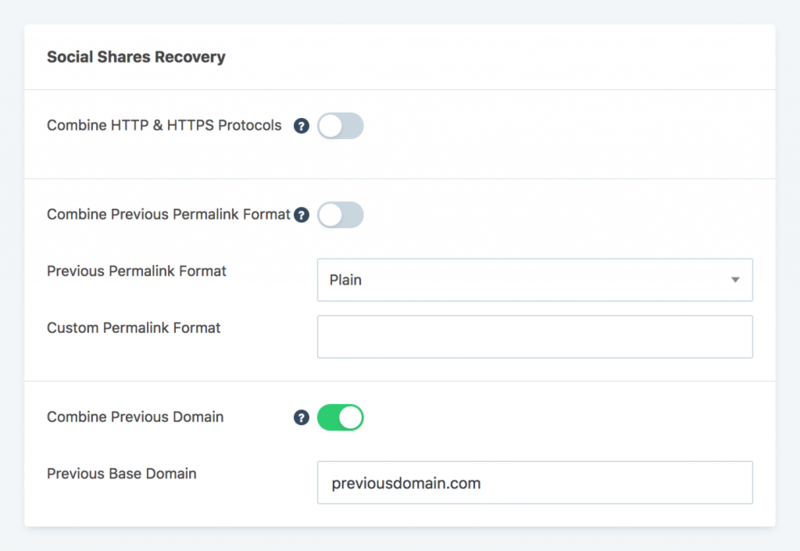 If you’ve transferred your website from one domain to another, recovering the social share counts for your previous domain is easy. You just have to activate the “Combine Previous Domain” option and fill in the previous domain name as shown in the screenshot below. A particular situation you may find yourself in is the need to change the permalink for just one post, not the entire website. In this case, you can recover the lost share counts by adding the old permalink in the edit screen of that post. Save the post and all your shares will be right back. This is all there is to it. With just a few clicks you can recover your lost social share counts. This feature is one of the biggest additions to Social Pug and it required a lot of customer help. I’d like to thank each and every one of you that contributed with feedback.! I really appreciate the time and effort you put into helping me make Social Pug better! 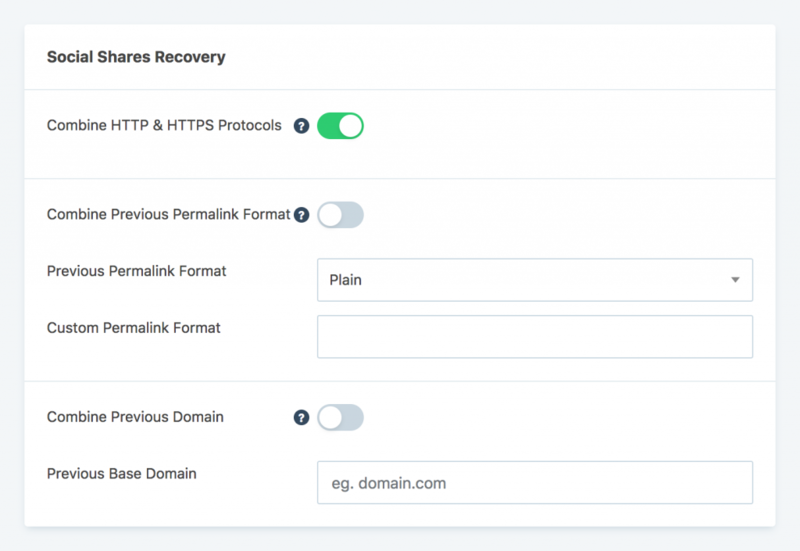 Important notice: If you’ve changed your permalink structure multiple times and have redirects in place, the social recovery system may not be able to return all social share counts. This is a limitation certain social platforms have and for the time being there’s nothing that can be done.